Opening: September 17, 2009, at 8pm. Opening on September 17th, Michel Soskine will be exhibiting recent works by Cuban American photographer Abelardo Morell (La Habana, 1948). 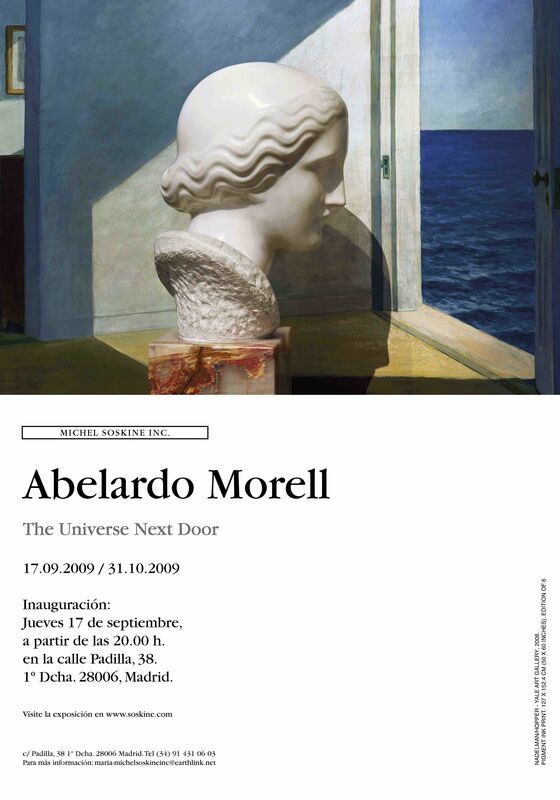 Untitled "The Universe Next Door", Morell’s second Madrid show, will present for the first time large camera obscura color photographs together with smaller black and white still lives. "The Universe Next Door" seems to deepen in Thoreau’s quote “The Universe is bigger than our vision of it”. In Morell’s words, Life is too big, too radiant and chaotic... Since we cannot afford to see Life directly, we all need a medium to enable us to see it. Morell’s medium is photography. It is his tool to reveal the secret, to make visible the invisible. Morell first picks out a scenario, a particular anonymous room. Within the original choice is already prescient the idea of the future projected image of the exterior, an election that will define the geographic location of the room and result in a visual interplay between both spaces. In the tradition of the Camera Obscura, a technique rediscovered by Leonardo da Vinci, the artist first darkens the windows of a room to the exception of a pinhole letting the light in. Through it, the image of the exterior is projected, inverted, onto the interior. With time exposures of up to 9 hours, Morell captures the fusion of two Universes into a single image. This almost rudimentary process, which happens to be the basics of the photography, continues to amaze our high-tech generation. of the private and the public spaces, the intimate with the general. In the more direct black and white “still lives” of pens and mirrors Abelardo Morell reaches for Universal issues and, with great visual and emotional intelligence, captures these domestic mysteries with the eloquence of a portrait. Abelardo Morell works can be found in museums and institutions around the world such as the Metropolitan Museum, the Whitney Museum or the Museum of Modern Art in New York, the Boston Museum of Fine Arts, The Art Institute of Chicago, Le Centre Pompidou in Paris, The Gallerie degli Uffizi in Florence or the Victoria and Albert Museum in London. Several publications and books have also been published.